Summer is right around the corner, which for many families means one thing: Vacation Time! 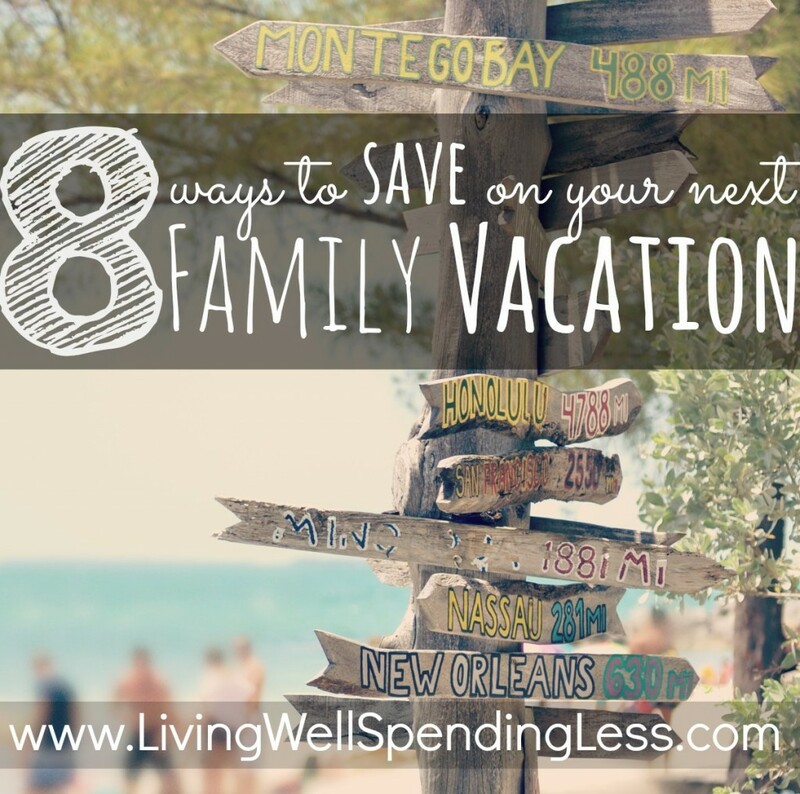 I don’t know about your family, but vacations have often been a budget-killer for ours. We think we’ve accounted for everything, and yet by the end of the trip we are find we’ve spent more than we planned for, whether it be on food, parking, or luggage fees. Those little things can sure add up! 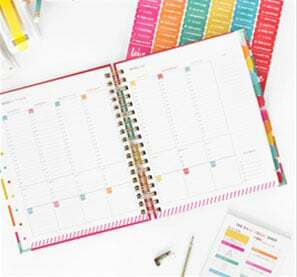 Whether you are just starting to plan your next trip, or you’ve had something on the calendar for months already, there is always time to minimize your trip expenses and to take the time to plan for how much you can afford to spend. It is a given that any time there are lots of people are traveling, you will pay more. If you want to travel to family destinations during any traditional school breaks or vacations, be prepared to pay a premium. There are far fewer “deals” to be found when school is out of session. If you are planning a trip to a theme park or a major national park like Yellowstone or Yosemite, consider sneaking in just ahead of the rush (before Memorial Day) or after it has already died down (just after Labor Day). The lowest crowds are historically found at Walt Disney World the two weekends after Labor Day. Not only will you spend less on food, lodging, and transportation, you will also manage to avoid the super heavy summer crowds. Book your flights, when possible, on one of the three cheapest days to fly: Tuesday, Wednesday, and Saturday. Whether you are searching for better prices on flights, car rentals, hotels, or even cruises, new “smart” travel sites like CarryOn.com can actually do extended searches over a period of time to find you the best price and send you an alert when a great price has been located. Simply search for flights, hotels, or other travel needs like you normally would on any other travel site. After you’ve selected the best option you are given an option to purchase immediately (in case you can’t wait) or to watch the price and be alerted if it drops. CarryOn will re-run the search once a day, alerting you to any changes and price or any other similar deals. It is important to know exactly what is and is not included in your hotel stay when creating your vacation budget. Be sure to check whether your rate includes special features (like a great pool), food (breakfast or happy hour), parking (sometimes up to $30 a day extra), resort fees, internet fees, and taxes, which vary greatly by state. If you are traveling for a week or more, be sure to check whether your hotel has laundry facilities; being able to do a load of laundry mid-trip can greatly reduce the number of items you will need to bring. Eating out is expensive and can easily kill your vacation budget, even if you’ve vowed to stay strong. The fact is that hungry people make bad money decisions! Avoid getting stuck in a situation where you need to pay for overpriced meals by packing an overabundance of healthy snacks. Make sure to bring things that won’t melt or spoil in a hot car, such as nuts, crackers, dried fruit, granola bars. If there is not one in your room, most hotels will provide a small refrigerator if requested. Be sure to call ahead to know if that option is available. If you are bringing or lunch items such as cereal or bread with peanut butter & jelly, be sure to also bring a few utensils and bowls in the event your hotel does not provide them! Florida is not always hot. Alaska is not always cold. Be sure to pack enough that your entire family is prepared for any kind of weather, but not so much that you are overloaded. Being prepared will help you avoid needing to purchase appropriate clothing at your destination, in the event the weather is not what you expect. Bring clothes that are versatile and easily layered. Be sure to have a jacket & umbrella in case of rain. For kids, bring clothing that is cute & comfortable, preferably in darker colors that don’t show dirt quite as easily. When packing for multiple people, it is easy to forget the essentials! Make a list for each person, and be sure to include swimsuits, underwear, pull-ups & diapers (if necessary), sunscreen, toothbrushes, toothpaste, & other essential toiletries on the list! My personal secret for packing for my two daughters is matching clothes. They don’t always wear the same thing every day, but packing is a breeze when I can just grab two of everything! If your destination is within 24 hours of driving, consider making it a road trip instead of flying. Yes, it will take you a little longer to get there, but the cost of driving a family of four will almost always be much, much cheaper than flying. Time spent in the car doesn’t have to be wasted vacation; make it fun by planning some good old-fashioned car games and stopping at roadside attractions along the way. You may just find that getting there is half the fun! A little pre-planning can go a long way when it comes to vacation activities. As soon as you know where you are going, sign up for email alerts to local daily deal sites (such as Groupon or Living Social), then take advantage of great discounts on local restaurants and attractions when you see them. Just be careful not to go overboard, as most of these group discounts are prepaid! If you are planning a trip to a major theme park, watch prices carefully before you go, and do your research. And remember, you are FAR more likely to find significant discounts during off-peak times! Cruising is a pretty cost effective way to wrap lodging, food, entertainment, and even childcare into one reasonable price. Sign up for price alerts at “smart” search sites such as CarryOn.com to find the very best rates. If your choice is between going into debt or not going at all, DON’T GO. There is nothing more stressful than coming home to a pile of bills you can’t afford. No matter how carefully you plan, the cost of traveling—especially with kids in tow—adds up very fast. 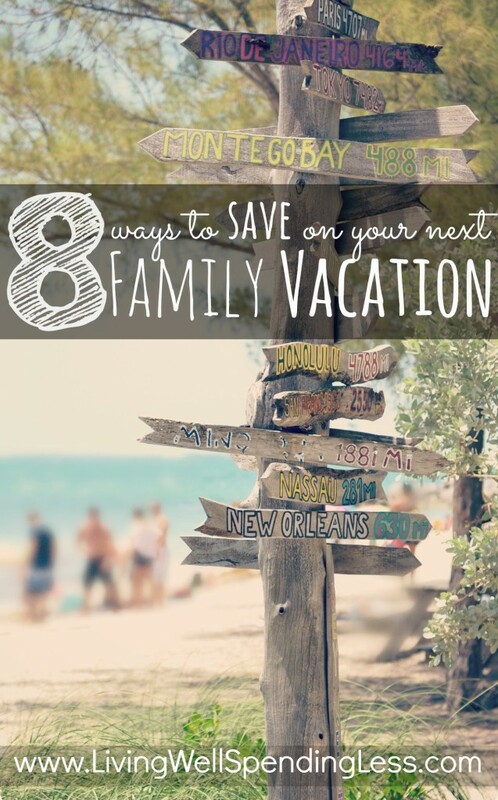 If money is tight, consider skipping the family vacation this year in favor of a “Stay-cation”. There are plenty of memories you can make at home that cost almost nothing. Before making your plans, do an honest assessment of what you have to spend and what the actual costs of the trip are likely to be. 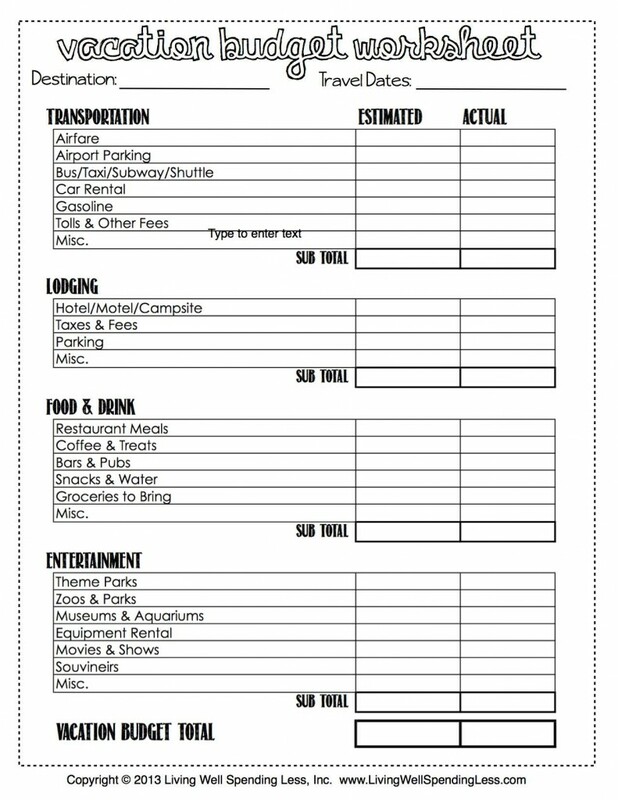 Use this handy printable vacation budget worksheet to make sure you don’t forget anything! If the numbers don’t match up, consider postponing your trip until they do! We always drive! With 4 kids flying is just not an option. Thanks for the tips. I don’t blame you Dawn! We usually drive too….those plane tickets add up fast! These are all great ideas. We always try and find the best value in a hotel. My husband and I travel at least once or twice a month for church, business, or personal reasons. Most of these trips are one nighters, but the costs add up. Even though we are being reimbursed or provided some travel expenses, we like to be frugal to make our dollar stretch. Although I hate their customer service, I haven’t been able to find a hotel site that beats Priceline’s “Name Your Own Price” option. I have used it many, many times for one night stays with great success. For example, tonight we are staying at a 3 star hotel for $48 (before taxes). The hotel has great amenities, including free parking and a complimentary breakfast buffet. However, I have also used Priceline for longer trips. In the beginning of January, I booked four nights at the Residence Inn Lake Buena Vista – which is in the Walt Disney World area – for $60 a night. Not only did our room have a kitchen area, the hotel had a massive complimentary breakfast buffet (rivaling Embassy Suite’s awesome breakfast buffet), it also had free parking and free transportation to the parks – which saved us $28 in parking fees. Camp! Okay, it’s not as glamorous as those fabulous hotels we used to stay in when our family only consisted of 2, 3, 4, or 5 people. Now, though, we would have to get a suite by law with five kids and two parents, which is ridiculously pricey. For the same price as one night in a hotel and a little extra in fuel, we can borrow a camper and stay all week! Leaves lots of money to do the fun things during the day and room to run off extra energy in the evening! & you create GREAT memories!!! I’m definitely in the “Just don’t go” camp. We are poor newlyweds with no budget for vacationing at all, but someday we will. And when we do we will definitely be doing it the cheapest way possible! This is a great list of practical ideas. Thanks! Also, I love the budget worksheet. We have one, but I never thought to keep track of what we actually spent. 🙂 Pinned both of these! it a look. I’m definitely loving the information. I’m book-marking and will be tweeting this to my followers! Cruises…the cheapest way to go. Room, food, entertainment, and even some childcare included! Do your homework, book early, and enjoy! We’ve been on 11 cruises and seen 16 countries…no way we could have afforded that any other way. We use our credit card rewards for our vacations. My husband and I each have an airline credit card which gives us a $100 companion fare each year. We charge everything on then but pay off our balances each month while still racking up miles. So we have been able to fly our family of 5 to Hawaii or Mexico for less than $1400. We drove to Florida in 2012 during spring break. My parents were renting a place for a month and they were still there. We stayed there for all but the driving time and one day at Disney. We took a hotel out of the park, we drove over that morning, packed a lunch and snacks, all 4 of of brought water bottles, I had bought shirts and souvenirs for all of us before, including bags for the kids, and had their Disney bags on the foot of their beds the morning we left for Disney. We ate at Golden Coral for dinner the night of Disney, so we could have all we wanted and desert. I let the kids take an extra desert (we were on vacation). We also literally stayed until the park closed, I’ve never seen my son literally crawl into bed (he was 3 at the time). For 10 days we spent $1500 total, that includes all souvenirs, gas, lodging, food, and the kennel for the dog at home. We did make sure we were home before the Kennel closed on Saturday so we didn’t have to spend money on two more days. Granted we made it by about 1/2 hour but we still made it. 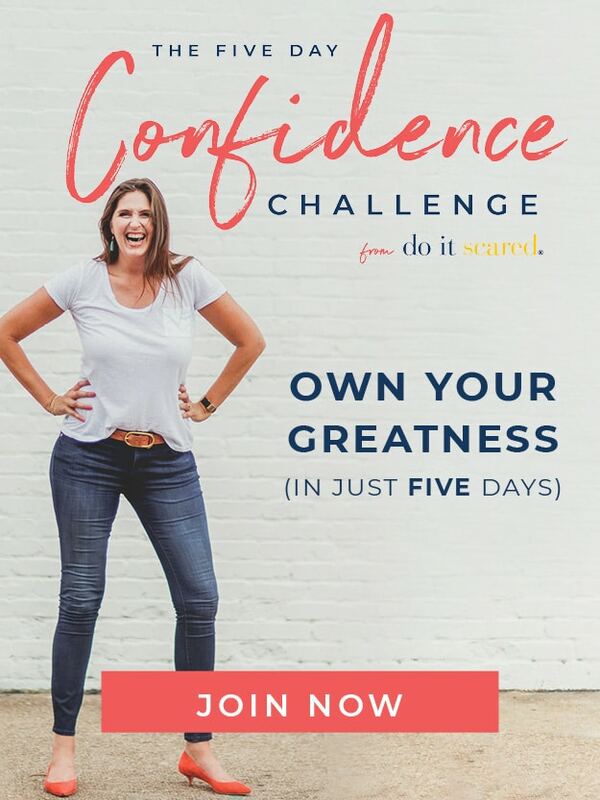 LOVE the printable!! Is there a way to remove “Type to enter text” from the document? Thanks! Another great tip is to Google the local grocery stores in the area in advance. You’ll see their specials and learn if they have a prepared food section. Getting a rotisserie chicken, some sides and a bag of salad is a great and inexpensive meal for just two or a whole family. Buy a pack of paper plates and plastic wear and you’re set for nearly any meal on the road. What a VERY informative blog for saving on family vacations! Well done…so useful. I love the way you have simplified everything.